I have been a nurse at DUHS for nearly 4 years. 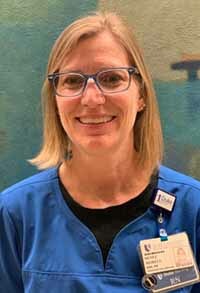 I began as a staff nurse in the OR neurosurgery service, worked as the charge nurse for the DMP/Duke North OR and transitioned to the Nurse Manager role at the Duke Ambulatory Surgery Center in 2017. In this role, I am responsible for 24/7 supervision of clinical patient care and compliance with policies and procedures as well as participating in the development of the strategic and operational plans. I supervise approximately 45 full time employees. I have worked as a nurse for 30 years. I received my BSN and Masters of Business Administration (healthcare) from University of Scranton. Prior to coming to Duke I worked as the Director of Nursing/Administrator for an independently owned Endoscopy Center. In order to advance in my leadership career, I stepped out of management to learn the skills and environment that would allow me to move forward again in a leadership capacity at a multi-specialty facility. Since coming to Duke, I have had the opportunity to invest time in my own professional development by taking courses such as Guide to Managing, Crucial Conversations and Leadership SIM. Participating in the Duke Management Academy and working with a mentor will help me be more effective in my current leadership role by increasing my awareness of my strengths and opportunities and offering me exposure to other leaders' perspectives and insights.